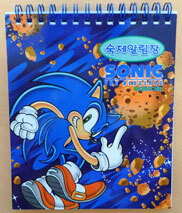 When did Sonic the Hedgehog catch on in Korea? 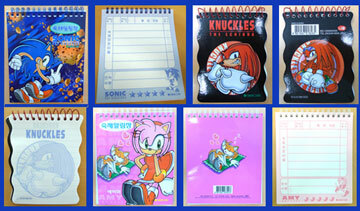 (Write in if you know...but it appears to be around the time of Sonic X) Korea has a fair amount of interesting Sonic items. There are sure to be more, so if you live there, visit there or know anyone who has anything that's not on this page, please do send it in! These detailed & quality goods are both colorful & interesting. Will a classic item show up? Why don't these things ever turn up on ebay? There are still questions to be answered. Look how popular Amy Rose is! She's got a whole set of colored pens/markers themed just for her! There's a flower & bow pink motif Amy design on the front of the clear plastic holder. Each pen has several pictures of Amy, along with a row of hearts. Cute & colorful, these are very suited for Amy or her fans. This is a plastic puzzle featuring the cast of Sonic Adventure 1. You can see it's in sort of a bag like packageing. The back of the card seems to have mini 1 line character descriptions/profiles of the characters in the puzzle. The puzzle is incomplete/pieces shuffled in this photo. Photo by SonicTeam. 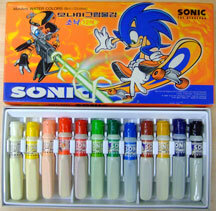 This is a water color paint set with a Sonic theme. The colors are either powders or thick gels in little plastic tubes. You dilute them a bit on a pallet to use. The Sonic theme here is a little strange, as it has E102 Gamma in the background, shooting a spiral green laser at/near Sonic who is on a bent skateboard. This was released around the SA1 era, so it used that early SA art. It's great to see E appearing on goods though. Photo by SonicTeam. This is a collection of fun, mini spiral note pads. They look like list pads...possibly for homework or something. Each pad is different. 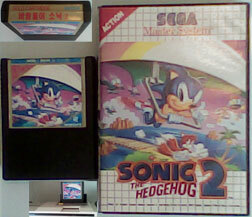 The Sonic one shows him with meteors/space setting, and has stars & SA blue-tone art inside. The Knuckles one has wiggly edges, red coated plastic spiral & blue-tone Knuckles disk shaped art inside, with simple lines for writing. 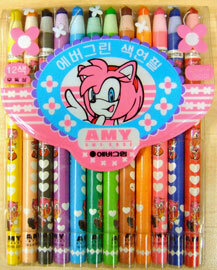 The Amy one is nice & pink, but look at Tails sleeping on his towel in the background. He's emitting/bubbling/snoring hearts out. 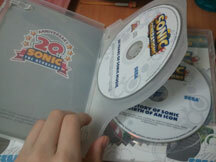 (The Sonic note didn't have anything interesting on the back, is why it doesn't appear here) Photo by SonicTeam. 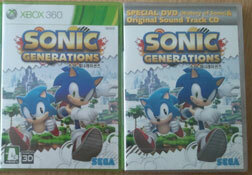 Korea got its own exclusive bonus content with Sonic Generations. It got a "Special DVD with Original Soundtrack CD". (See both in photo at right) Note the Korean text on the box (but then why is everything else in English, wouldn't that confuse people who can't read it?) What's the content like on the special DVD? Is it similar/same as what Europe got? This is a great bonus package. 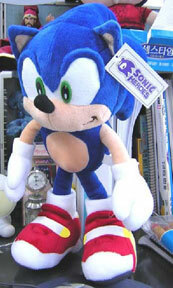 This is a set of modern Sonic plushes, only sold in Korea. Here, they are in some sort of prize machine, sitting on a top shelf. They're all pretty large...and pretty detailed as well.